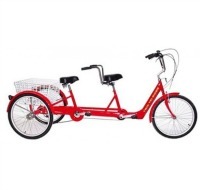 A tandem tricycle lets you share the fun with another adult or child. They offer several advantages over a tandem bicycle. Not only are they much more stable they are a lot easier to start moving which can be a little tricky with a tandem bicycle. A tandem tricycle lets you just get on and ride with very little practice. A tandem bicycle requires way more practice to learn to ride safely and in control. With a tricycle you can stop at will and rest without any balance problems. They make great trainers for children since they can learn to pedal and ride without needing to balance. And the child is right behind you so you can talk to them with ease. The front rider ( or pilot ) controls the trike and the rider in the rear ( or stoker ) simply adds pedal power. The tricycle shown above offers optional back-rest and seat belt. Shimano 6 speed thumb shift. Stoker seat area is most suitable for a person less than 6' tall. Extended 400mm seat post for tall folks. Go here for complete information.